Krema Coffee started life in Farnham, where the original store opened its doors three years ago. Despite its relatively closeness to Guildford, for a variety of (not very good) reasons, I’ve still not visited, so I was quite pleased when Krema decided to come to me, opening its second store in Guildford. Naturally, the actual opening, at the end of March, took place while I was out of the country, but as soon as I was able, I paid Krema a visit. Occupying a long, low-ceilinged spot at the castle end of Tunsgate in the centre of Guildford, Krema goes a surprisingly long way back, with a basement-like space at the back. When it comes to the coffee, Krema uses Horsham Coffee Roaster, sadly absent from Guildford town centre since the closure of Bar des Arts (although still available from The Flying Coffee Bean at the station). The Workhorse seasonal blend is the mainstay on the espresso machine, where it’s joined by a single-origin guest (also from Horsham). Meanwhile, there are a couple of options on pour-over through the V60, although in reality you can try any of the beans that Krema has in stock. If you’re hungry, there are light breakfast and lunch menus, backed up with copious quantities of cake. Krema Coffee is perched on the corner where Tunsgate meets Sydenham Road, opposite the new Tunsgate Quarter shopping centre and just two doors along from Kalm Kitchen. The modest shop front consists of a single, slightly recessed floor-to-ceiling window with a door on the left-hand side. A pair of two-person round tables stand in front of the window, tucked in so that they are off the pavement and sheltering under a large blue awning. Despite this, the west-facing aspect means that they catch the afternoon sun. Inside, taking advantage of the generous window, is a cluster of tables at the front. Three two-person tables are arranged in a triangle to the right of the door, with a four-person table against the right-hand wall. Meanwhile, there’s a solitary two-person table against the left-hand wall, directly in front of the door. Krema goes a long way back, the sense of length accentuated by the low ceiling. The counter is on the right-hand side, a cut-off corner facing the door, from where it runs to the back of the main room. There’s more seating at the back, with one two-person and one four-person table against the left-hand wall opposite the far end of the counter. You can also perch on one of two stools at the end of the counter, where you’ll find the small brew bar. However, there’s more to Krema than initially meets the eye. In the middle of back wall, a square opening leads, down two steps, to a basement-like space, beyond which is the kitchen and the toilets. There’s lots more seating back here, including an L-shaped bench to the right with three two-person tables. Meanwhile, three two-person tables line the left-hand wall, with a five-person table against the back wall. I can see this being a really cosy space come autumn/winter. There’s a fairly concise breakfast and lunch menu, with porridge, toast, granola and the like, plus toasties, salads and quiches at lunch, all prepared in the kitchen at the back. Wherever possible, Krema uses local suppliers, which extends to the milk, which comes from Medina Dairy in Windsor. When it comes to coffee, Krema uses one of my favourite roasters, Horsham Coffee Roaster. The Workhorse seasonal blend is joined by a guest espresso, which changes every couple of weeks. Alternatively, you can try a pour-over, with another pair of single-origins highlighted on the board by the grinders. In reality though, if you ask nicely, Krema will make you a pour-over using any of the coffees it has in stock. I was immediately drawn to the guest espresso, a Kenya Kianderi AA. 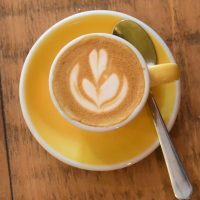 Although the barista recommended it as a flat white, I was keen to try it as an espresso as well, so I asked for a split shot, essentially ordering a single espresso and a piccolo, both of which arrived in classic, yellow espresso cups. As an espresso I found it surprisingly smooth and not the punch in the mouth that I was expecting from my previous experiences with Kenyan espressos. Instead it was a well-balanced coffee with great body which went equally well in milk, providing a rich, well-balanced piccolo. Sadly that’s all I had time for on my first visit, but I’m looking forward to working my way through the menu over the coming months! December 2018: Krema Coffee Guildford was a runner-up for the 2018 Most Popular Coffee Spot Award. This entry was posted in Breakfast, Cafes, Cake, Guildford, Laptop Friendly, Lunch and tagged include by Brian Williams. Bookmark the permalink.